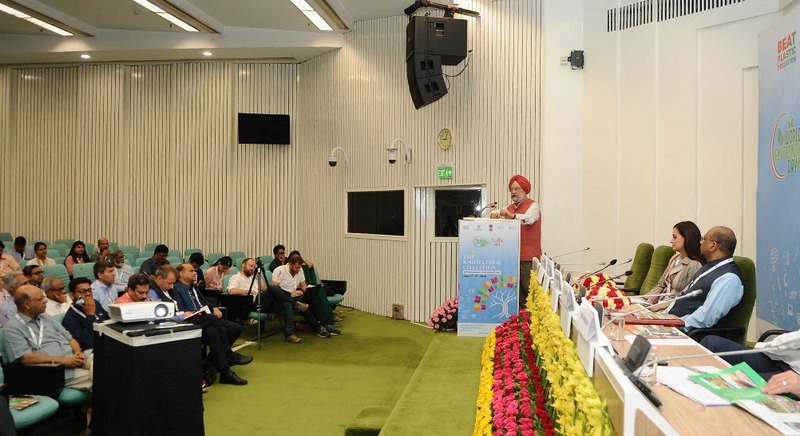 The Minister of State for Housing and Urban Affairs (I/C) Shri Hardeep Singh Puri addressing the session on ‘The Knowledge Coalition-Intelligent Conversations’ as the part of the World Environment Day celebrations in New Delhi on June 3, 2018. The Minister highlighted how with cities emerging as the drivers of the national economy, India stands at the threshold of a critical moment in its developmental trajectory where adequate opportunities must be created for cities/towns to grow, flourish and become vibrant centers of investment and productivity. Acknowledging India’s crucial role in addressing global issues on mitigating climate change, the Minister shared how India has made some far-reaching commitments towards the larger welfare of the planet like being committed to achieving the UN Sustainable Development Goals by 2030 and being a signatory to various important international environmental agreements, including commitment at the COP 21 to reduce the emission intensity of its GDP by 33% by 2030 even while growing at a fast pace. Acknowledging the challenges ahead, the Minister called for strong and committed partnerships among the governments, academia and industry at the international, national and local levels in order to achieve the goals of sustainable growth.